In one sentence, XSharper is a framework and scripting language for writing Windows console and simple GUI applications quickly, with or without Visual Studio. a Swiss-knife tool for writing, compiling, debugging and running code from the command line on any Windows computer. Visual Studio not required. .ZIP support is built in. There are many other pieces in XSharper source code that can be used without creating a dependency on the whole XSharper.Core assembly. XSharper development was inspired by many different tools and frameworks, from ASP.NET to parts of Windows Workflow Foundation, from Microsoft Build XML projects to special scripting languages like Microsoft PowerShell. 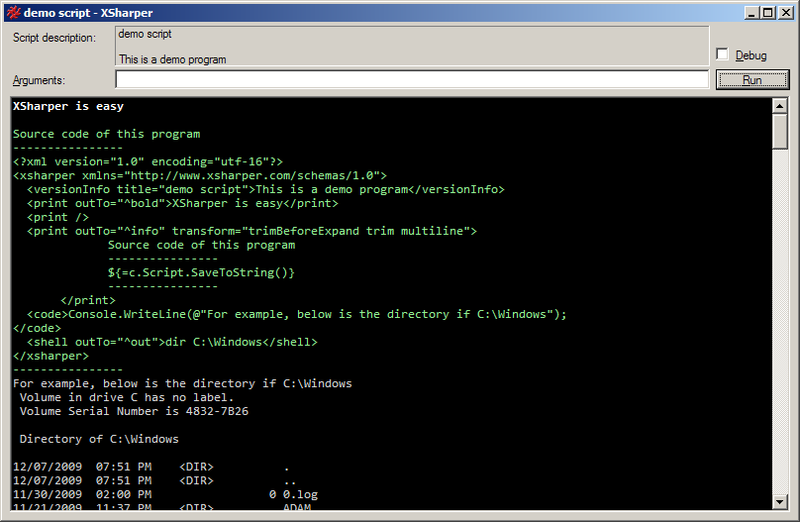 In many ways XSharper is to Windows console applications what is ASP.NET to Web applications. It's a framework that consists of multiple simple classes, from parsing user input to downloading files, from formatting output to evaluating expressions and executing SQL, that boost productivity considerably. Certain frequent operations may be combined into actions, that may be further glued together with XML, producing a simple language where programs can be written without any C# code, not unlike ASP.NET or MS Build scripts. Like ASP.NET, XSharper program using XML syntax may be interpreted or converted to C# source code or .EXE file in a single step, and even back from .EXE to XML. Because it's a framework, it's also possible to glue XSharper actions and classes with PowerShell, Visual Basic, or any other .NET programming language. PowerShell is primarily a shell for non-programmers to automate administrative tasks on one or multiple computers. As a scripting language, it's a powerful language with its own unique syntax. An explicit installation is required on XP/Vista/Windows 2003/Windows 2008 machines. Even though it is free, it is not open source, and is not redistributable either, so using PowerShell scripts adds prerequisites to your application. There are many other examples in Library.